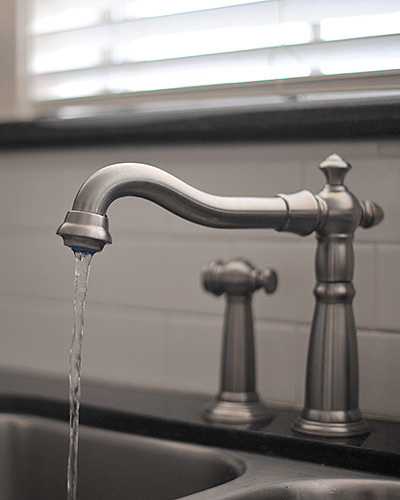 Kitchen plumbing problems with your sink, faucet, garbage disposal, dishwasher, or ice maker water line can be repaired quickly by Eagle Plumbing. Gus Heinze, a licensed master plumber, can also repair, replace, or install the hot and cold water connections and water supply lines to the washing machine. When you need an experienced plumber, call Eagle Plumbing to help you keep your kitchen in good running order. We fix or repair the following kitchen plumbing problems. Clear running water is essential for the kitchen faucet. Eagle Plumbing can install the following kitchen appliances for you. Be careful about the types of liquids and solids that are poured down the kitchen sink drain. Some liquids, such as grease and butter, can harden and clog up the kitchen sink drain. If these types of liquids have been poured down your drain, call Eagle Plumbing for dependable drain cleaning. Some solids, such as corn husks or lettuce, have fibers that can clog your drain. If that happens, don't worry. Eagle Plumbing can clear the drain and get your garbage disposal back in business.